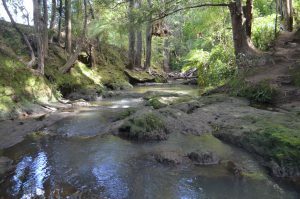 The Albany Totara Walkway is a tranquil walk that follows the Oteha Stream through wonderful native bush. 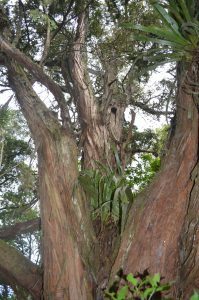 Many of the trees are very large native Totara’s and truly magnificent. The native birdlife is wonderful with their constant songs ringing high above in the treetops. This walkway is suitable for most people but not one for pushchairs, buggies or wheelchairs. 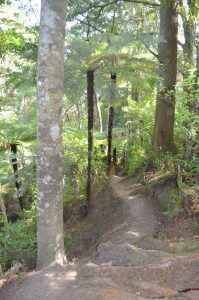 The track is dirt or gravel and while a very good walking track, it is narrow in places and has plenty of tree roots and stairs. The Torara Track is reasonably flat (check out the elevation map below) but does have one hilly section with a climb of about 25m in altitude. The Albany Totara Walkway is approximately 3.5km for the return trip, although can be shorterned by crossing the river at the concrete slab one of the many rock weir’s. The slab is sown on the GPS map – note it is only available when the stream is low. The track is accessible from a number of entrances and parking is relatively available. There is a well equipped playground en route, located between Syracuse Place and Northwood Ave. There are a number of entry points along the track, although most are not signposted and a little difficult to find. Thankfully they are on the GPS map, so this can guide you to the entrances. Bush Road – park by the bridge next to Pinehurst School. Entrances are on either side of the bridge, one taking you clockwise and the other anti-clockwise around the track. Obelin Close – this is a small street with parking at the end. Other non-exit streets in the vicinity will give access via the paved walkway. These do not directly interact with the walkway. These streets have parking and include Vanderbilt Place, Syracuse Place and Northwood Ave.
Albany Highway entrance next to the bridge. The entrance is okay but parking will be a challenge. 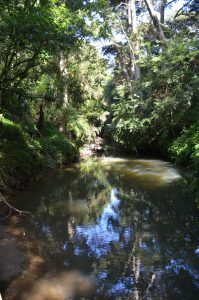 This track is all about big native trees, the stream and native birdsong. 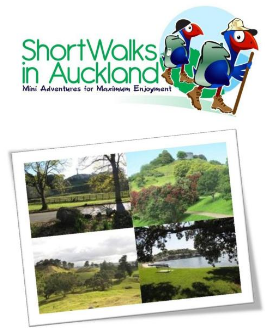 The Totara Walkway is a dream for those looking for a good off-road loop to run. At 3.5km and plenty of flat plus little undulation it will provide a good environment for those training runs. There are some aspects of the track that will require a little more care with uneven surface and narrow sections. Concrete slab across the river as shown on the GPS Map that can only be crossed when the stream is at normal levels. A part of the river that has a lot of rock with a narrow flow of water that be jumped across – there are stairs that lead up from the steam at this point. A wooden board bridge that crosses a small stream and can be underwater in a deluge. There is a detour track that is shown on the GPS Map. This track is not suitable for wheelchairs or buggies. It has too many parts of the track that are narrow. There is also a lot of tree roots and some stairs. 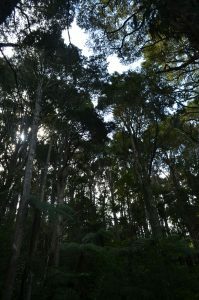 The Albany Totara Walkway is a wonderful track that can be walked by people of most abilities. The large native trees are spectacular and the stream provides many picturesque moments. ‹ Pt. View Reserve Views and Bush!